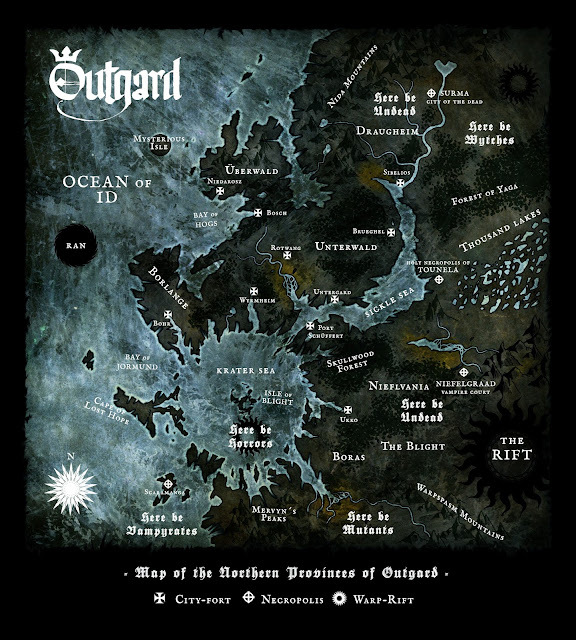 It really wasn´t planned but suddenly I found myself hunched over my wacom drawing a map for Outgard (or at least the northern part of it). Every fantasy world needs a map I guess - it´s almost like a law of nature. Here you go. Clickable for a biggerized version for your convenience. I´ve never really been that fond of drawing maps, not even during my days of roleplaying, but I got to admit I had a jolly good time creating this one. Cheers mate! Thought you´d like it! But I hear the fishing´s good this time a year! A fine looking map! Is the game going to take place in multiple locations on said map? Or is that still up for consideration? I think we´ll focus on a some travellers going to Holy Tounela with their dearly departed. That´s the only place you can bury people safely. The ground is so saturated with magick there´s a large risk grandpa comes back to eat your brains if you just stick him in the ground wherever. Wow, very cool. I like the names. Brueghel & Bosch must be really nice places. You've managed to make this map surprisingly interesting, I can't help but wonder about all the small details. What force formed the krater sea? What disaster struck Surma? I will all be revealed! Or not! It is both very real and atmospheric at the same time. Eager to see the locations themselves! Me and Alexander are working on the terrain right now! Borlänge and Borås. Sorry, Borlange and Boras. Sounds rainy. Yep. And Westeros apparently has nice cucumbers. Mervyn's Peake - brilliant. I always thought there was a bit of Gormenghast in 40k. A brand new grim dark world with you as master cartographer ? Well, you got all my attention buddy ! Ok, I am crying of sheer joy now... This whole project will be the best thing ever done! I cannot wait to see more, please keep posting this amazing stuff! Been on vacation and comes home to a brand new interesting collaboration - fun times. And those names made smile really wide. I love it! Are you going to lay in hexes over to it to so as to keep track of progress, or? This is a really good looking map, great job! What techniques did you use to make it? Thanks!